We thank the Virtual Learning Leadership Alliance for providing data and support to help develop this brief. The information below is a summary version of the longer Summary Brief available as a downloadable .pdf document available to the right. 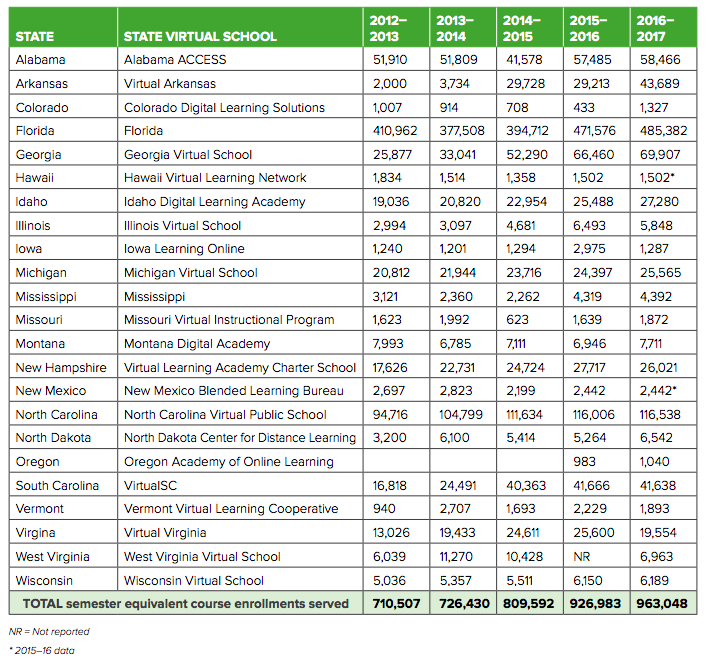 State virtual schools (SVS) are an important part of the online learning landscape, collectively serving over 420,000 students and approaching one million supplemental online course enrollments in 23 states during the 2016–17 fiscal year. They are among the largest and most recognized providers of online courses, instruction, technology infrastructure, professional development, and other online learning related services to schools and districts across the states in which they operate. State virtual schools provide online courses and support services to schools across the 23 states in which they operate.1 Most data in this brief are from the 2016–17 fiscal year for school, district and state organizations. Most state educational systems work on a fiscal year from July 1 to June 30; a few start fiscal years August 1 or September 1. (See Figure 1 and Table 1.) State virtual schools are entities created by legislation or by state-level agencies, usually funded partially or entirely by a state appropriation, course fees and/or grants. Most state virtual schools are not “schools” as defined by the National Center for Education Statistics, as they do not grant diplomas and are not responsible for many of the functions performed by schools (re. administration of state assessments, state and federal reporting, counseling, etc. ).2 The term state virtual school was coined over a decade ago to describe statewide online learning programs created by legislation or state rule by the Southern Regional Education Board and the Keeping Pace with K-12 Online Learning reports. Instead, they supply online courses and related services to schools. Students are usually enrolled with district approval, with the exception of states with course access policies.3 Course access refers to policies that allow students to directly take one or more online courses from a provider other than the student’s district of enrollment and have their funding flow to the provider. Course access will be explored in more detail in a forthcoming Digital Learning Collaborative policy brief. Even then the school or district plays an integral role in counseling, mentoring and enrolling students in the state virtual school. Georgia Virtual School, Oregon Academy of Online Learning, Virtual Virginia, and other state virtual schools are part of their state departments of education. Idaho Digital Learning is a governmental entity separate from the state education agency, and was created by legislation with a Board of Directors responsible for oversight. Montana Digital Academy is administered by the state university system. Michigan Virtual School receives legislative funding, but is a 501(c)3 nonprofit organization with a Board of Directors providing oversight. Illinois Virtual School is administered through the Peoria County Regional Office of Education, which was awarded the Illinois State Board of Education contract to manage and operate the state virtual school. New Hampshire’s state virtual school, Virtual Learning Academy Charter School, was created through charter school rules. Although state virtual schools have different organizational and governance structures, most share similar characteristics. They provide teacher-led online courses, have administrative staff, enroll students, hire and train teachers, and maintain technology infrastructure to deliver and support online courses. They may create their own online course content, license content from vendors, use open educational resources, or combine content from various sources. State virtual school courses and services are generally funded totally or in part by legislative line items. Districts may be required to pay all or part of the cost of the courses in which their students enroll. In some cases courses are provided at no cost to schools and districts (Montana, South Carolina), or for nominal fees to help cover costs (Idaho). State virtual schools may receive federal or private foundation grants, but the bulk of state virtual school funding comes from the state allocation and/or course fees based on course enrollments. States with state virtual schools. Alaska, Texas, Utah and South Dakota previously were states recognized as having state virtual schools in Keeping Pace reports. We count a course enrollment as one student taking one, semester-long, online course. Florida Virtual School is by far the largest state virtual school, with 485,000 course enrollments in FY 2016-17. North Carolina’s school is the only other with more than 100,000 course enrollments. Other large schools, in absolute terms or in relation to their state’s student populations, include Alabama, Arkansas, Georgia, Idaho, New Hampshire, and South Carolina. 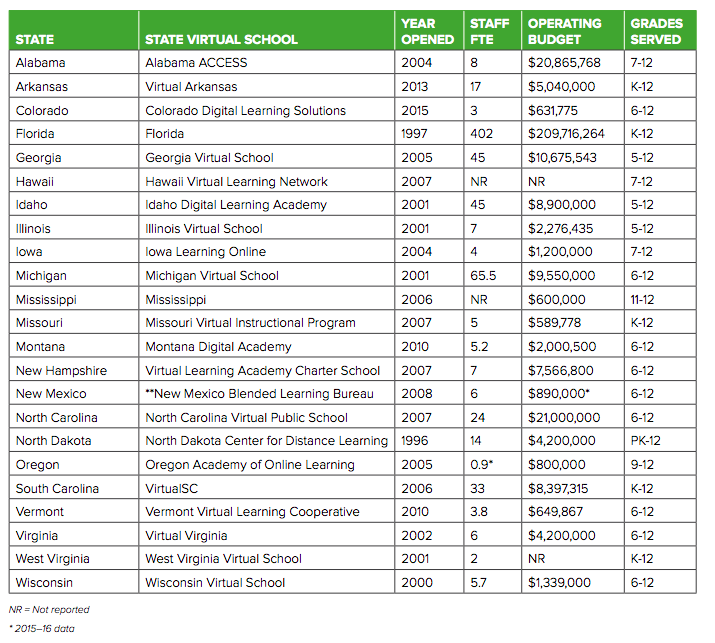 Most state virtual schools are growing, but at a slightly slower rate than in the past few years. Course enrollments collectively grew at a year-over-year rate of just under 4% during FY2016–17. Florida Virtual School had 3% growth, while North Carolina Virtual Public School reported flat course enrollment numbers. Since around 1997, state virtual schools have been among the early pioneers providing online learning options to supplement a student’s learning in the traditional school setting. Over the past decade plus, state virtual schools have significantly expanded the types of services and range of products they offer, while maintaining the traditional role of supplemental online course supplier. Innovative state virtual schools are now introducing and managing change in the delivery of online learning services. VirtualSC offered online keyboarding for South Carolina students in grades K–6 across 43 school districts in FY 2017–18, serving 81,598 elementary students. It also works with nine high schools to provide Virtual Learning Labs across the state for 469 students to receive support from certified teachers, mentors, and robots. VirtualSC started using five robots in 2014, further expanding the instructional reach of the Virtual Learning Lab program. Idaho Digital Learning, in collaboration with the Idaho Career & Technical Education, has developed Skillstack, a badging/micro-certification platform that enables Idaho’s educators to validate the skills of their students who demonstrate proficiency towards workforce-relevant badges. Institutions of higher education are able to award badges as evidence of proficiency within specific programs of study where the mission aligns with competency based mastery. The goals of Skillstack are to document, assess, and validate student skills utilizing industry and disciplinary defined standards to create a wider talent pool for Idaho employers, and to assist with the articulation of credit from secondary career and technical education programs into Idaho’s colleges and universities. Virtual Arkansas is offering art courses to students in grades 10–12 through a partnership with Crystal Bridges Museum of American Art, making the arts more accessible to students in all parts of the state. NCVPS addressed a pressing need in North Carolina by launching an English I course specifically designed for English Learners built with WIDA and Sheltered Instruction Observation Protocol (SIOP) supports. The course includes enhanced instruction to help English Learners with vocabulary and language development and includes a live class feature to help students build verbal communication skills with their instructor and peers. After a successful pilot semester, the course launched statewide in Fall 2016 and includes students identified as English Learners as well as traditional students. English II, with English Learner supports, launched statewide in January 2017. The Montana Digital Academy (MTDA) redeveloped its credit recovery program in 2015 to focus on creating a personalized learning path for students based on content mastery. All courses embed an advanced notification system that fosters communication between the MTDA teacher, local school support and administrative staff, parents and the students, so all stakeholders are informed of the progress or areas of focus needed for each student. Using adaptive release, students are presented with one task to be completed before the next task appears in their learning path. This redesign has resulted in enhanced communication to all stakeholders and a clear pathway to meaningful recovery of credit for students. During FY 2016-17 Montana high school students successfully completed 2,044 credit recovery courses, representing 27% of the overall MTDA course enrollments.